CardFellow’s Guide to Credit Card Processing provides accurate, unbiased information about credit card processing followed by a blueprint showing how you can quickly obtain truly low costs for your business. This no-nonsense guide will put you on the fast track to low credit card processing fees by teaching you the truth about charges, and then showing you how to put your new knowledge to work comparing processors. But before you jump into the guide, consider these important points. Much of the information available online and off about credit card processing is erroneous, slanted with sales jargon, or both. To get the most from this guide, do your best to disregard what you’ve learned from pushy salespeople. Start with a clean slate so you grasp the secrets of truly low rates quickly. Get your business’s fees as close to the sum of interchange and assessments as possible. Don’t worry if this sentence doesn’t mean anything to you right now; this guide will show you how to harness its cost-cutting power for your business. This guide covers a lot of ground quickly and skips some finer points of credit card processing. If you have questions along the way, we are happy to provide answers. Please post your questions on our Facebook page or email them to info@cardfellow.com. You can also search the CardFellow blog for a wealth of useful information about credit card processing. You don’t need to learn the intricacies of the credit card processing system to secure competitive pricing. In fact, the whole system can be boiled down to four primary components: issuing banks, acquiring banks, card brands, and credit card processors. Banks that issue credit cards to consumers play a big role in credit card processing. In addition to putting plastic in consumers’ hands, issuing banks influence the rates that businesses pay to accept cards. JPMorgan Chase and Bank of America are examples of large issuing banks. Acquiring banks maintain merchant accounts for businesses so they can accept credit cards. Wells Fargo and HSBC Bank are examples of large acquiring banks. The card brands are the architects and custodians of credit card processing. Visa and MasterCard both maintain a computer network that credit card processors use to route credit card transactions among issuing banks, acquiring banks, and businesses. The card brands don’t directly issue credit cards to consumers or merchant accounts to businesses. Instead, Visa and MasterCard oversee a network of issuing and acquiring banks working in association to do the legwork. ADMINISTRATION: Everything from setting the rates that businesses pay to accept credit cards to managing issuing and acquiring banks. NETWORKS: Visa and MasterCard each develop and maintain a computer network that routes transactions among issuing banks, acquiring banks and businesses. MAKING MONEY: The card brands have shareholders to please, so increasing card usage and revenue is paramount. Bonus: Where do American Express & Discover fit in? Unlike the networks of Visa and MasterCard that rely on many issuing and acquiring banks working together, American Express handles its business in-house. American Express’s closed-loop network allows the company to dictate its own rates. Until 2015, that explained why American Express’s rate remained the same regardless of which processor handles the transactions. In 2015, American Express rolled out a new pricing model called OptBlue, which allowed processors to add a markup to Amex transactions. We’ll address that later in this guide. The operational model of Discover’s network falls somewhere between the associations of Visa and MasterCard and the closed-loop scenario of American Express. However, Discover’s rates are similar to those of Visa and MasterCard and are generally less than those of American Express. The most competitive credit card processing solution is the one with the lowest markup over the sum of interchange and assessment fees. The ability to differentiate the components of credit card processing cost is critical to securing competitive pricing. If you can’t follow your money, you won’t know where it’s going, or even when it left. There are three components of credit card processing cost, one is negotiable and two are not. Fees paid to issuing banks and card brands are non-negotiable and remain the same regardless of the processor, but fees paid to the processor are open for negotiation. Here’s a closer look at which fees are negotiable and which are not. Each time a business processes a credit card, it pays a fee to the bank that issued the customer’s card. This is called an interchange fee, and it is calculated by adding a percentage of the transaction volume to a flat transaction fee. For example, 1.51% of volume plus a $0.10 transaction fee is the current interchange rate for a swiped Visa consumer credit card. If a business accepts this type of card as payment for a $100 transaction, it will owe the bank that issued the card an interchange fee of $1.61 ($100 x 0.0151 + $0.10). Interchange rates are determined on a per-transaction basis using the details of the transaction. Things like card type (credit or debit), card category (reward, commercial, etc. ), and processing method (swiped / keyed) dictate the interchange rate (percentage and transaction fee) associated with the transaction, and ultimately how much money the business will have to pay the issuing bank. Issuing banks don’t set interchange rates independently. Instead, issuing banks collectively agree upon rates through Visa and MasterCard. This is why all issuing banks charge the same interchange rates, and processors have no influence on them. Interchange rates are a non-negotiable component of credit card processing cost that remain exactly the same regardless of which processor a business uses. The following table provides examples of how much money an issuing bank collects in interchange fees from a $100 purchase. We’ve used Visa’s interchange rates in this example, but MasterCard and Discover’s interchange rates are similar to Visa’s. For example, if a customer uses her Visa credit card to make a $100 purchase, the business accepting the card will have to pay Visa $0.15 ($100 * 0.0011 + $0.0195). Credit Card Processing Dues and Assessments. Like interchange fees, assessments are a non-negotiable component of credit card processing cost that remain exactly the same regardless of which processor a business uses. Together, interchange and assessments are the “wholesale” cost of credit card processing. Your goal is to pay as close to wholesale – that is, as close to the sum of interchange and assessments – as possible. Any cost beyond the sum of banks’ interchange fees and card brands’ assessment fees is the processing markup. The markup is where processors, gateway providers, sales agents, etc. make money, and the markup is the only area of cost that varies among processors. Your goal in shopping for the most competitive credit card processing solution is to find the processor with the lowest markup and greatest value, and we will show you how to do that in just a bit. Markup includes any costs that aren’t interchange or assessments. Markups include processors’ monthly or annual fees, percentages, per transaction fees, statement fees, etc. Every processor has a markup – the only part that differs is how they disclose it. The sum of interchange fees and assessment fees is credit card processing’s version of wholesale, which remains consistent regardless of which processor your business uses. The only component of cost that varies from one processor to the next is the markup over interchange and assessments. For example, let’s pretend a customer uses her MasterCard credit card to make a $100 purchase at three different retailers, all using different processors. The table below splits the fee that each business pays into the three main components of cost: interchange, assessments, and markup. 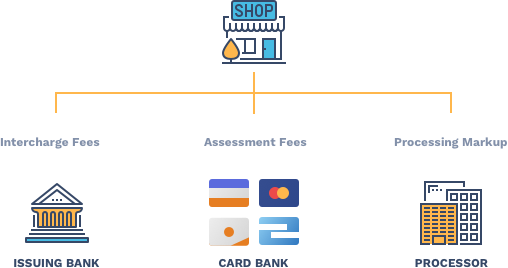 Notice that the interchange fee charged by the customer’s issuing bank and the assessment fee charged by MasterCard are exactly the same for all three businesses. The only component of cost that varies is the processor’s markup. Isolating the processing markup is the first step toward securing competitive credit card processing fees. Interchange and assessment fees are the same for all processors, so don’t worry about what you can’t change and focus instead on what you can: the processor’s markup! CardFellow Makes It Easy! instantly and save. CardFellow’s free service delivers instant competitive quotes from multiple credit card processors, and our software calculates the components of cost of each quote for you. CardFellow does the math so you don’t have to. Sign up for free today and save! The pricing model a processor uses has a greater impact on cost than its rate. Processors can use different types of pricing to charge fees. Pass-through pricing separates the three components of cost, resulting in a consistent, transparent markup. Bundled pricing combines the three components of cost resulting in expensive surcharges and a hidden markup. Pass-through pricing is the one you want, bundled pricing is not. You know from the last section that interchange fees charged by issuing banks and assessment fees charged by card brands are the same regardless of the processor you use. What is not consistent among processors is how each one passes these fixed costs to your business. Processors typically use one of two pricing models to assess charges to a business and can select the pricing model on a per-case basis. So, any given processor can charge some businesses using bundled pricing and others using pass-through pricing. As we will outline below, pass-through pricing is the most transparent. With pass-through pricing, a processor bills interchange fees charged by banks and assessment fees charged by card brands directly to a business at cost. Essentially, these fixed costs are “passed through” to the business. The processor makes money by charging its markup as a single flat rate and a single transaction fee. For example, 0.25% of sales volume plus a $0.10 fee for each transaction is a typical pass-through markup. You may also hear pass-through pricing referred to as interchange-plus pricing, cost-plus pricing, or flat rate pricing. The image below illustrates the flow of fees on a pass-through pricing model. Notice how the business essentially pays fees to the issuing bank, the card brands and the processor directly. The table below provides a few examples of how the components of cost are reported and charged on pass-through pricing. Notice how all rates and fees are clearly visible as an individual component of cost, and how the processor’s markup stays the same regardless of the interchange rate charged by the issuing bank and the assessment charged by the card brand. IS LESS EXPENSIVE: The processor’s rate remains the same regardless of the underlying interchange rate charged by the issuing bank resulting in a consistent, low markup. ELIMINATES SURCHARGES: There are no mid-qualified and non-qualified surcharges with pass-through pricing. (More on this in a moment). IS 100% TRANSPARENT: The three components of cost are reported separately on month-end statements, allowing a business to see a complete picture of fees. ALLOWS FOR INTERCHARGE OPTIMIZATION: Ensuring that the majority of transactions process at the lowest possible interchange rate is called interchange optimization, which is only possible when interchange categories are disclosed on a statement. With bundled pricing, a processor pays interchange fees to banks and assessment fees to card brands and charges the business based on its own set of qualified, mid-qualified and non-qualified rates. The qualified rate of a bundled pricing model is the lowest, followed by the mid-qualified rate and finally the non-qualified rate. For example, rates of 1.69% qualified, 2.25% mid-qualified, and 2.99% non-qualified each with a $0.25 transaction fee are a typical example of bundled pricing. The processor effectively “bundles” interchange fees, assessment fees, and its markup into its own rates, thereby completely concealing the fixed cost of interchange and assessments from unsuspecting businesses. You may also hear bundled pricing referred to as tiered pricing or bucket pricing. To make matters worse, the processor gets to choose which transactions are considered qualified, mid-qualified, or non-qualified. The ability to route a business’s transactions to the rate of its choice allows a processor to increase the business’s cost without having to increase its rates. All the processor needs to do is route more of the business’s transactions to its higher mid- and non-qualified rates. The final nail in the bundled pricing coffin is that it makes it impossible to accurately compare rates among processors. Even if several processors quote the same exact “rates,” one processor may route certain transactions to its lowest qualified rate that another will route to its highest non-qualified rate. The image below illustrates the flow of credit card processing fees on a bundled pricing model. Notice how the business pays the processor and the processor pays interchange fees to the bank and assessment fees to the card brand. The table below is in the same format as the one used to illustrate pass-through pricing in the previous section. This table provides a few examples of how the components of processing cost are reported and charged on bundled pricing. Notice how the fixed costs of interchange fees and assessments are not disclosed, making it impossible to calculate the processor’s markup. Take a moment to compare this table with the one in the pass-through pricing section. Take note of how pass-through pricing fully discloses the components of cost separately, and how the processor’s rate and fee remains the same for all transactions. This is why pass-through pricing is less expensive and easier to reconcile. Results in a high, inconsistent markup: The processor does not disclose what it pays in interchange and assessment fees for each transaction, so there is no way for a business to calculate the processing markup. Additionally, the processor bundles numerous interchange fees into just three rate categories (qualified, mid-qualified, non-qualified) resulting in an inconsistent markup. Results in hidden fees: Bundled pricing allows a processor to completely conceal the fixed cost of interchange and assessment fees making it impossible for a business to calculate its markup. Does not allow for interchange optimization: Read more about the important topic of interchange optimization on CardFellow’s Blog. Note that not all types of bundled pricing break down into qualified, mid-qualified, and non-qualified rates. A popular type of pricing commonly known as “flat rate” is actually a form of bundled pricing. Instead of routing transactions to three “rate” bundles, flat rate only charges one rate for all transaction types. For example, you may be charged 2.75% or 2.9% + 30 cents. These rates will apply to all your transactions. While flat rate-style bundled pricing looks simple, it’s not transparent and often expensive. The processor doesn’t show you what is paid in interchange and assessment fees, so there’s no way to determine what you paid as a markup. That is, there’s no way to see how much you paid the processor as profit. 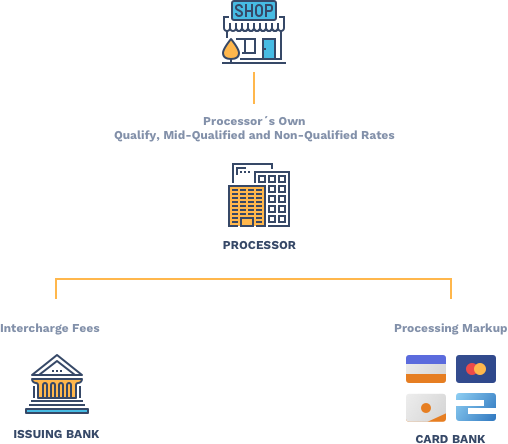 Now that you know the credit card processing ecosystem, the negotiable and non-negotiable components of cost, and the two different pricing models processors use, let’s put your knowledge to work by learning how to compare processors to find the ideal processing solution for your business. CardFellow has banned bundled pricing to protect your business! Before being allowed to offer certified quotes in the CardFellow marketplace, each processor must sign a contract that forbids bundled pricing. CardFellow protects your business and makes it easy for you to find honest, competitive credit card processing rates. Sign up for free at CardFellow today and get competitive quotes from multiple credit card processors instantly. It’s free, private and the average business saves a ton! Warning — Pit Fall!Pass-through pricing has the potential to be the most transparent, least expensive pricing model, but willing sales people know how to game the system. Don’t assume a processor is offering competitive rates based solely on the pricing model. As we will discuss later in this guide, be sure to look at the big picture and consider all rates and fees. The most accurate way to measure the competitiveness of a processor’s rates and fees is to calculate the effective rate being careful to assume the same fixed costs of interchange and assessments for all processors. CardFellow’s software does this for you, but if you’re looking for a processor on your own, you can read more about the effective rate on our blog. Take control and dictate your terms to prospective processors. Only consider offers based on pass-through pricing, and demand the best offer first. Concentrate on the processor’s markup and don’t get sidetracked by non-negotiable interchange and assessment fees. TIPDon’t give your current statement to a processor until you have a quote! If you provide a billing statement in advance, you may be leaving money on the table since the new processor knows they only have to undercut your current pricing by a small amount. Finding a competitive credit card processing solution means putting what you’ve learned from this guide to work by knowing what to look for and getting tough with processors — here’s how to do it. If the first question you ask a processor is, “What’s your rate?” The processor will likely offer bundled pricing, which opens you up to surcharges and hidden fees. The pricing model a processor uses has a greater impact on cost than its rates, and the pricing model also dictates your ability to accurately compare offers. The first thing you should say to a prospective processor is, “I will only consider quotes that use pass-through pricing.” Not only is pass-through the least expensive pricing model, it ensures you will be able to compare offers from different processors on a level playing field. Interchange rates charged by issuing banks and assessment fees charged by card brands will be the same regardless of which processor you choose, so focus on what you can change as you’re comparing offers — the processing markup. Pass-through pricing makes isolating the markup simple because the processor’s rate and fee remains the same for every type of transaction whether swiped, keyed, reward card, commercial card, or otherwise. To calculate the markup, simply multiply the processor’s rate and transaction fee by your business’s average monthly volume and number of transactions. For example, the table below shows how three pass-through quotes (of 0.20% plus $0.15, 0.35% plus $0.10, and 0.50% plus $0.08) compare for a business with average monthly credit card sales of $10,000 resulting from 100 transactions. As you can see from this table, interchange and assessment fees are the same for each processor; only the markup changes. This is why it’s important to focus on the processor’s markup when comparing credit card processors. Leave the number crunching to CardFellow! The easiest and fastest way to find a competitive credit card processor for your business is to sign up for free at CardFellow to receive multiple instant quotes. Sign up for free and our software will automatically calculate the processor’s markup for each quote you receive. How do I compare my current processor’s bundled rates to pass-through pricing? The short answer is: there is no comparison. Bundled pricing is almost always more expensive than pass-through pricing. Aside from the cost difference, bundled pricing conceals the fixed costs of interchange and assessment fees, results in surcharges, and allows the processor to increase costs without increasing rates. When is flat rate less expensive? Flat rate pricing may be cheaper if your average transaction is under $10 or if you process less than $5,000/month in credit cards. Comparing bundled pricing and pass-through pricing requires a solid understanding of banks’ interchange charges, which is not something most people care to take the time to learn. Part of the free service we provide at CardFellow is a comprehensive analysis comparing your current processor’s rates to the lowest quote you receive in our marketplace. Businesses currently on bundled pricing see an average cost reduction of 40% after selecting a pass-through quote in CardFellow’s marketplace. If you’d like to know how your bundled pricing stacks up, get quotes for a baseline, and then send us your statement for assistance. Processors charge several different types of fees, including transaction fees, monthly fees, and annual fees. With this in mind, it’s important to look at each quote in aggregate, being careful not to focus solely on one particular fee such as the processor’s rate. Continuing with our example from above, the rate of 0.20% quoted by Processor A produces $20 in monthly fees. If this processor also charges an $18 monthly statement fee and a $160 annual fee, the combination of these two charges breaks down to $31.33 a month (($160 annual fee / 12 months) + 18 statement fee), which is more expensive than the $20 fee resulting from the rate. Compare each processor’s quote by calculating the total monthly markup including every charge. The easiest way to do this (aside from signing up at CardFellow and letting our software do it for you) is to use a table like the one below to calculate each processor’s monthly markup using your business’s average monthly sales and transaction figures. As you can see from the table, once we add each processor’s monthly and annual fees to our running cost, the processor with the lowest rate (Processor A) becomes the most expensive, and the processor with the highest rate (Processor C) become the least expensive. This is why it is important to consider all rates and fees equally when comparing processors. The processor with the lowest volume markup (rate) is often not the most competitive overall. At CardFellow, we guarantee that each processor’s quote will be fully disclosed, and all fees are separated by category as shown in the screenshot of a sample quote below. Finding a competitive credit card processor is a game that’s all about offense. If you don’t make the rules, processors will, and the odds of getting competitive pricing will be stacked against you. Take a page from our playbook at CardFellow and stop asking questions and start telling processors what it takes to earn your business. To protect businesses that use our service and to ensure processors offer only honest competitive quotes, each processor must sign a contract agreeing to abide by CardFellow’s terms before it is allowed to offer you a quote in our marketplace. We’ve listed the terms below that processors must abide by before being approved by CardFellow. If you are shopping for a credit card processor on your own, use our terms as a template for what to require from prospective processors. Doing so will save time and ensure you receive only honest competitive quotes. Pass-Through Pricing Only accept quotes based on pass-through pricing. Best Offer First You’re busy and haggling is a waste of time. Demand that each processor offers its best pricing first. Don’t provide statements or disclose other offers you’ve received before you are offered a quote. Pass Interchange Credits When a business issues a credit card refund it is supposed to receive a credit from the issuing bank for a portion of the interchange fee paid on the original purchase transaction. However, many processors keep this credit instead of giving it to the business. Require all of your prospective processors to pass interchange credits to your business. Don’t waste time asking processors if they have certain fees. Require each processor to provide a fully disclosed quote in writing listing every rate and fee. No Rate Increases — Ever Processors will go kicking and screaming at the mention of this demand, but we know it can be done because every quote at CardFellow is guaranteed for life. CardFellow provides each business that uses our service with free lifetime monitoring to ensure rates never increase. If you’re shopping processors on your own, don’t ask if a rate will increase; demand that it never increases, and get it in writing. No Cancellation Fees Refuse to pay a cancellation fee, and get a waiver in writing. A processor that offers an honest competitive quote should not have to charge a cancellation fee to retain your business. However, a processor that waives a cancellation fee is acting fairly and has earned a chance to address issues before you cancel.A processor may claim that it can’t waive a cancellation fee, or that it can’t edit its bank’s application in order to waive a cancellation fee in writing. Every quote at CardFellow is accompanied by a written cancellation fee waiver, so we know that such a waiver can be provided.Keep in mind that some processors (like a few at CardFellow) may waive a cancellation fee by providing a signed addendum to the formal application instead of updating the parent bank’s terms directly. No Equipment Leases Never lease a credit card machine. You’ll end up locked in a long contract and pay much more than you would have by purchasing the machine outright. Equipment leasing is forbidden in CardFellow’s marketplace. Certain credit card machines, POS software, and gateways only work with one particular processor, making it necessary to purchase new equipment when switching to another processor. Require all processors to disclose whether the equipment they are selling is proprietary. If so, strongly consider asking for alternative equipment that is universally compatible. Full Cost Detail on StatementsRequire all processors to disclose a detailed breakdown of the three main components of cost on monthly processing statements. Without this information you can’t calculate the processor’s markup to ensure your costs are accurate and competitive.We have searched far and wide for quality processors willing to agree to our stringent demands, so if you’re shopping on your own, don’t be discouraged if processors scoff at your list of requirements. Simply move on to the next prospect; there are literally thousands to choose from.Of course, you can also let us do the work for you by signing up for free at CardFellow to receive multiple quotes from processors that already abide by these terms. Processors’ rates and fees increase if left unchecked, and interchange fees charged by banks must be monitored to ensure the lowest cost. Read processing statements monthly to ensure the processor’s markup does not increase and that interchange fees are optimized. Getting competitive rates and fees is a task with a clear finish line, but making sure costs remain low requires an ongoing commitment and a little bit of know-how. We call it “rate creep” at CardFellow, and it goes like this: You sign on with a processor that offers competitive rates, but shortly thereafter the processor slowly increases rates and adds additional fees. By the time you notice what has happened, a year has passed and you’ve been duped out of hundreds or even thousands of dollars. The only way to stop rate creep is to monitor a processor’s charges — even if you have a guarantee that pricing will not increase. This is exactly why CardFellow provides free lifetime monitoring for every business that chooses a processor through our marketplace. If we find that a processor’s rate does not match what was quoted, the processor is required to correct the discrepancy so you don’t lose money. Monitoring your monthly processing statement is the only way to ensure the fees you worked so hard to obtain remain low and unchanged. If you are unsure of how to read your statement, ask your processor for an explanation. Any business that chooses a processor through CardFellow is also welcome to contact us with any questions about charges or for help reading a statement. Interchange fees charged by issuing banks account for the largest portion of credit card processing cost, and every type of transaction is associated with an optimal (lowest) interchange rate. Many things can cause a business’s transactions to be processed at higher-than-optimal interchange rates – also called downgrading – resulting in increased cost. In many cases, it is possible to reduce interchange fees by modifying a business’s processing behavior or equipment/software to allow more transactions to process at a lower interchange rate. Ensuring that the majority of transactions process at the lowest possible interchange rate is called interchange optimization. CardFellow is a credit card processing comparison website that helps businesses find competitive rates and fees in less than three minutes by delivering instant quotes from multiple credit card processors. Credit card processors agree to CardFellow’s terms in order to offer quotes in its marketplace. Then, each processor creates a number of different quote templates indicating the lowest rates and fees it is willing to offer various types of businesses. When a business signs up for free at CardFellow.com our software instantly selects the most competitive offer from processors’ templates based on the business’s details. Fully disclosed quotes are displayed to businesses along with CardFellow’s unbiased comprehensive cost breakdowns, estimates, and analyses, but processors are not allowed to see the business’s contact information. This ensures that businesses are not pressured by sales calls and emails while reviewing offers. Each business that uses CardFellow is welcome to our free consultative services as well as a comprehensive analysis comparing current processing rates to the best offer received in our marketplace. Once ready, a business selects a winning quote with the click of a button and the winning processor is allowed to see the business’s contact information to begin the setup process. CardFellow’s software also locks the processor’s rates and fees for reference in future monitoring. Sign up free today to see how much your business can save. The interchange fees charged by issuing banks are credit card processing’s version of wholesale, and Visa and MasterCard publish a large portion of these fees online at the links below. How much do processors typically charge for card-on-file updater services? Our business is membership-based and my processor doesn’t offer this service for expiring/replaced cards Thanks! Different processors charge differently for a card updater service. Braintree has told us in the past that it’s included in their base flat rate, while other company charge a monthly fee or a setup fee. Your best bet will be to work with a processor that offers it and confirm with them what they charge for that service. I hope this helps! Wow.. even your blog is full of confusing jargon. It’s endless. I have a small business and am ADD and dyslectic. There has got to be a better way to cut through the confusion and make simple for people like me. I do approx. 2.5 million a year and still don’t know if I am over paying for processing fees. This is sad. Please help with simpler explanations. Sometimes it’s easier to talk about it than to read the guides. If you haven’t yet filled out a business profile to see numbers, you can do that here: https://www.cardfellow.com/sign-up. Then please give us a call and we’d be happy to explain how it all works and go through the quotes with you, or provide a savings analysis. We’re at (800) 509-4220. Greetings Ellen! I’ve recently been approached by Cypressbay Solutions an ISO out of Cincinnati. Would you have any reviews or comments you can share? I thank you in advance…be well! I’m not familiar with Cypressbay Solutions, but you could invite them to place a quote for you through CardFellow so you can compare it easily with other processing companies. You’ll just need to make sure you have a free profile set up with us. You can do that here: https://www.cardfellow.com/sign-up. I absolutely LOVE CardFellow and have no intention of every using anyone again unless found through them. I have had my own business for 9 years now. Over the first 3 years, I went through 2 or 3 different processors, only to discover how unscrupulous and deceitful their practices can be. Between hidden/undisclosed fees and charges and poor customer service, I was constantly frustrated. I even had one company continue to charge me monthly fees for a full 6 months after I had formally cancelled their service! I called them month after month to have them refund the charges and was told that the refund would be processed during the next cycle. Well, they would refund the charge from the previous month and then proceed to charge me again for the current month!! It was maddening calling them month after month. Finally threatened to get a lawyer involved and it was mysteriously worked out immediately. CardFellow not only found me a processor with great, transparent fees and customer service, but CardFellow does indeed continue to contact me on a regular basis requesting I upload my most recent statement so that they can compare it to my original quote from my processor to ensure I am not being charged for things that were not in the original contract. They follow up on their referrals and I love it. Furthermore, CardFellow walks you through the process of gaining your PCI compliance every year. Love it. We’re glad you’ve had such a positive experience, and we look forward to continuing to help your business. Do you have to do a settlement at the end of the day? I can’t find where it says how much in credit card sales we did for the day. Transactions do need to be settled, yes. I suggest contacting your processor for assistance. I didn’t see anything about PCI Compliance fees. Is that an additional fee that will be added later from processors acquired on this site? My current processor charges me an annual fee for compliance. They also want to charge me an even larger annual fee to have access to their tools to make the process easier, but I opt-out of that fee. PCI Compliance fees aren’t necessarily charged – that’s up to the processor, it’s not a mandated fee. Some processors charge a PCI compliance fee, some processors charge a PCI non-compliance fee (only applied if you’re not compliant), some charge both. Signing up to get quotes is the best way to see the PCI fees from specific processors, as there is no one right answer. You’re kidding, right? There are only a HANDFUL of companies that are actually in the business of processing card transactions – what there are thousands of to choose from, are unregulated resellers, who have to pay those processors to carry out the movement of funds and other information. You’re urging business owners to continuously sift through that sea of third-party sales organizations? Talk about running in circles and chasing one’s tail..
And if anyone should be savvy to cutting middlemen out of the process, so you’re not paying extra people along the way, it should be those like yourselves- assuming you own & operate businesses. How do you think big companies, such as Walmart, negotiate bankcard costs? They’re certainly not doing what you’re advocating.. And what’s being proposed here is automatically excluding small business owners from the basic benefits large companies receive. The main question any merchant should ask first isn’t about all these details around fees.. With a fundamental understanding of the industry, why would anybody do that? You want to get as close as possible to to Visa & M/C and their base rates (interchange), as if they were directly doing the processing themselves. OTOH if you want to let essentially every guy who teamed up with his friend and started “Bob & Joe’s credit card processing”, who outsources the service to an acquirer.. if you want all them in existence to have a shot at earning your account…well, have fun with a process like that. We’re referring to registered ISOs. It’s true that unregistered agents can be a different story, but ISOs that are registered (which is disclosed in the footer of their website and can be corroborated through Visa’s global provider lookup) are a safe bet. We take care of all that sifting and research. Processors (and ISOs) that place certified quotes through our marketplace have to sign a contract with CardFellow so that we can dictate what they can and can’t do within our system. We find that it actually does the opposite. Without an understanding of how this process really works, small business owners are much more likely to fall into the trap of tiered pricing, gouging, and other expensive solutions. That’s what we advocate early on in the guide, with the call out text: “Get your business’s fees as close to the sum of interchange and assessments as possible.” It comes up repeatedly throughout this and other articles we’ve published. Who does the processing on the back end is basically irrelevant to a merchant looking to get the lowest costs. ISOs set the pricing if a business goes through them, and the fact that it’s an ISO doesn’t automatically mean higher pricing. At CardFellow, we work with direct processors and with ISOs and there are times that direct processors aren’t the lowest cost. That can be true whether it’s a small mom and pop store or a multi-million dollar publicly traded company. We help both types, and everyone in between. If you’re seeing a lot of “non-qualified” transactions, that means you’re on tiered pricing. Unfortunately, tiered pricing is one of the most expensive for credit card processing. On the upside, that means there are definitely better options. What I’d suggest is filling out our short form to see instant quotes from multiple companies. It’s completely private (we don’t give out your contact info, so no pushy sales calls) and free. Check it out by clicking here. Is Leaders Merchant Services one of yours? The are passing on the Mastercard Location fee of $2 a month starting with their September statement. What do you charge for your service? Thank you. We don’t work with Leaders Merchant Services. CardFellow’s service (assisting you with finding the most competitive processing solution and providing ongoing support) is free. The charges from processors in our marketplace vary depending on your business, but you can get free, no-obligation quotes (with no sales calls) by filling out a quick form: https://www.cardfellow.com/sign-up. You’ll see the quotes instantly after filling out the form and you can call us with any questions about the charges. I hope this helps! Hi! I’m starting a sales career in Card Processing and would only like to work for a fair company, so I’m curious what your experience with Heartland has been? I greatly appreciate this guide! Very helpful! Hello, what is your opinion on Flagship Merchant Services? Do they work with you guys? Flagship Merchant Services does not have a contract with CardFellow and doesn’t place certified quotes through our marketplace. I have a technology company in Latin America and I want to help my clients to card processing a better cost. These processors are only for USA or other countries? At this time, we can only assist businesses in the US. Also I need to process credit cards at our retail store, online, and possibly on the delivery route. Does this incur additional charges and is there any specifics on using all these methods I need to know before asking for a quote? You’ll receive 3-4 quotes instantly, but you can request additional quotes if needed. You’ll be able to process cards through multiple methods, you’ll just need to disclose that when you use the quote request tool. The charges will be included in your quote. You can go here to get started: https://www.cardfellow.com/sign-up. Please feel free to call or use our livechat function if you have questions as you’re reviewing your quotes. I’d be happy to explain and help you find the right option. I’m thinking about signing up with Chipayments, you know anything about them? Hello, I am with ACCPC Huntungton NY am about to meet with Electronic Payments Calverton NY. Do you have any history with either of these companies? Neither of those two companies work with CardFellow, so I can’t really offer firsthand experiences. In any case, I’d highly suggest that rather than setting up meetings with processors who will tell you what you want to hear to get your business, you simply use CardFellow’s quote comparison tool. It’s completely free to use, and you can request fully-disclosed quotes from any processor you want, and review them in private. (We don’t share your contact info.) Our software puts all the quotes in the same format, so they’re easy to compare side by side, and we’re available to answer any questions and provide an unbiased opinion to help you make an informed decision. If you want to use the quote request tool, you can go here: https://www.cardfellow.com/sign-up. Hey great read! I’m looking for a credit card processing company for my business. Ran across a few including, Ironwood Payments? Wonder if they’re any good. Ironwood Payments doesn’t place certified quotes through our marketplace, so we can’t guarantee anything about their rates or terms. The company appears to be a DBA of or somehow affiliated with ElitePay Global, a company that has negative reviews and reputation online. The best thing to do is to sign up for a free CardFellow account and use our instant quote comparison tool to get fully-disclosed competitive quotes for your business. I hope this helps!